Pickup from Las Vegas hotel will take you to the Henderson Airport, where you’ll receive a safety briefing to prep you for your flight. 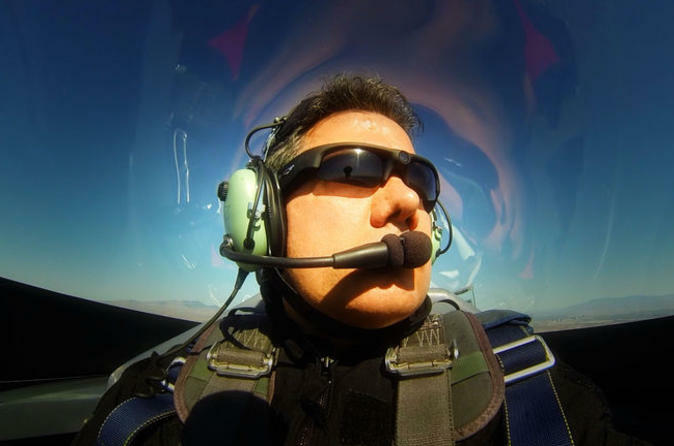 You and your expert pilot will board your state-of-the-art aerobatic Extra 330LC, this style of plane has been in the air race industry for 30 years. Both planes are meticulously restored, and the Waco biplane seats two in the front seat, so you both can experience this exciting moment with a friend. Take off and soar low over the beautiful mountains and valleys of the Mojave Desert on an adrenaline-pumping flight. Catch great views of the surrounding sights and see the Las Vegas skyline from above! After the flight, you'll complete a military-style landing, where the plane comes in at an elongated spiral -- a tactic used by the military to make it difficult for the enemy to shoot at the plane. You'll then be taken back to your hotel with unforgettable memories to share. Special Offer - Book and save 36% compared to the local supplier's prices! - Book Now!